30 Year Mortgage rates are currently averaging 3.45%. 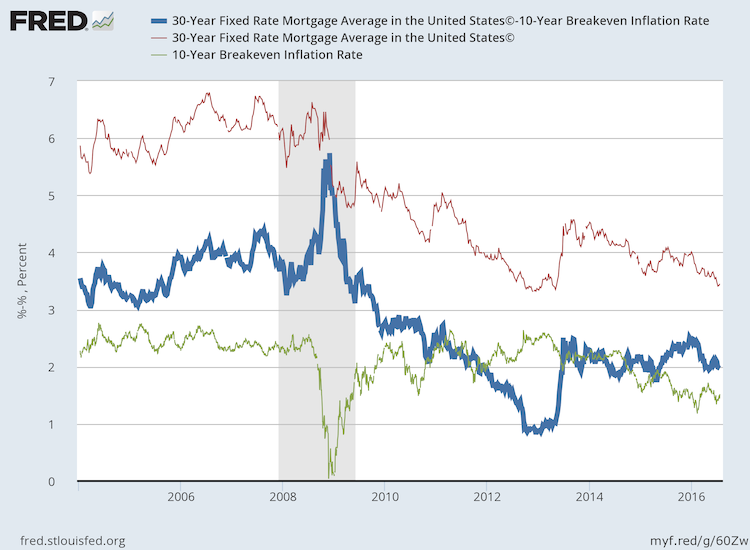 There is a 30 year mortgage rate average series on FRED, published by Freddie Mac, which has noted a down-trend in the average 30-Year Mortgage rate. 3.45% is the lowest we’ve seen since a brief period in late 2013 where the average was about a dozen basis points lower. As we’ve done in the past, we decided to mash it up with ’10 Year Inflation Breakevens’ to see what the ‘cost’ of a mortgage is on top of inflation. This is, as you know, a controversial series – but it’s a great quick proxy for market inflation expectations. What you do is take the yield on an inflation adjusted security (go to Treasury Direct if you’re interested in such a product) and subtract it from a non-inflation adjusted one. That leaves you with the ‘breakeven’ CPI amount to square the two series. (Where the ten-year breaks down is fodder for another article! We’ve written on these pages about the interesting history of the 30-Year mortgage and how mortgages were the catalyst for largely increased home-ownership in this country. So… that’s half of our piece. The blue line is the one to concentrate on here: that’s the difference between market inflation expectations and the average 30-year mortgage you can get today. In essence, it’s also what banks figure (or what Freddie Mac and Fannie Mae figure) they can capture as a spread with full repayments. (Or, alternatively, you could take savings account rates or similar). Roughly translated: you can get a mortgage at 3.45% when the market is pricing in about 1.52% inflation over the next ten years. Of course, if the rate doesn’t fall enough you won’t be refinancing – but banks are counting on capturing only a ~1.97% spread over that time. That’s not a huge return for such a long instrument. What Does a Low Spread Mean? Well, for the consumer it’s a good thing. Other than a brief period with the spread closer to 1% in 2013, we’re getting historically good deals on mortgages. This is, suffice to say, some very cheap debt! What does it mean? If you didn’t hop on a refinance back in 2013, you should definitely start your research. That goes even for people who refinanced in 2014 – we’re back down near the lows set that year. Shop around, of course, but there are some excellent deals out there. Can rates go lower? Yes, of course – even if the spread stays constant, market inflation expectations could cut to even lower levels. If the spread tightens even more we’re back near 2013 territory in spreads. Then you’re looking at some very good deals indeed. But, hey – you could just refinance again if rates fall. So, readers, what do you think? Are there good deals out there? Will you be refinancing (or buying?) this year? Do you expect even lower mortgage rates? Where do you put inflation over the next ten years?